Learn the right French pronunciation of all the Paris subway station names of “la ligne deux” (Paris métro line two): “Porte Dauphine / Nation” with a Paris native free and clear recordings of the Paris métro stop names + Paris subway maps + tips on how to ride the Parisian subway. “La ligne 2” of the Paris subway is the second oldest Paris métro line of the network, and it’s quite special since the train gets out of the ground from “Barbès Rochechouart” station to the “Jaurès” stop offering a nice view of the city. The station “Anvers” will give you accès to “Montmartre”, and the “Père Lachaise” stop to the famous eponym cemetery. The second line of the Paris subway stops at “Charles de Gaulle Étoile” offering a convenient alternative to the “ligne 1” which can get crowded during rush hour. 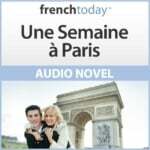 Click on the audio bar to play the audio recording of the Paris métro stations for line number 2. If you do have to make a connection, on the map, look carefully at the line; each station is indicated by a point on the line. If two lines cross, you have a white circle (or an oval), which indicates the possibility of changing from one line to another. It is there that you should exit your train, walk through the halls and follow the signs that will indicate the path to your connecting train. There are great great apps to prepare your subway trip.